You are here: Home › Oracle Decks › “Les Vampires” Oracle Deck available for pre-order! 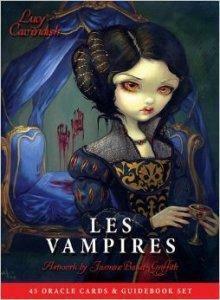 “Les Vampires” Oracle Deck available for pre-order! You can now pre-order my new “Les Vampires” Oracle Deck up at Amazon here – it will be out March 31st, but you can get your order in now to reserve your copy! It will be available worldwide shortly also through Blue Angel and other distributors. For more details about the deck, photos of sample cards, etc. click HERE to visit Blue Angel. Very excited about this one, and the book is written again by the fabulous Lucy Cavendish!